Anonymous. 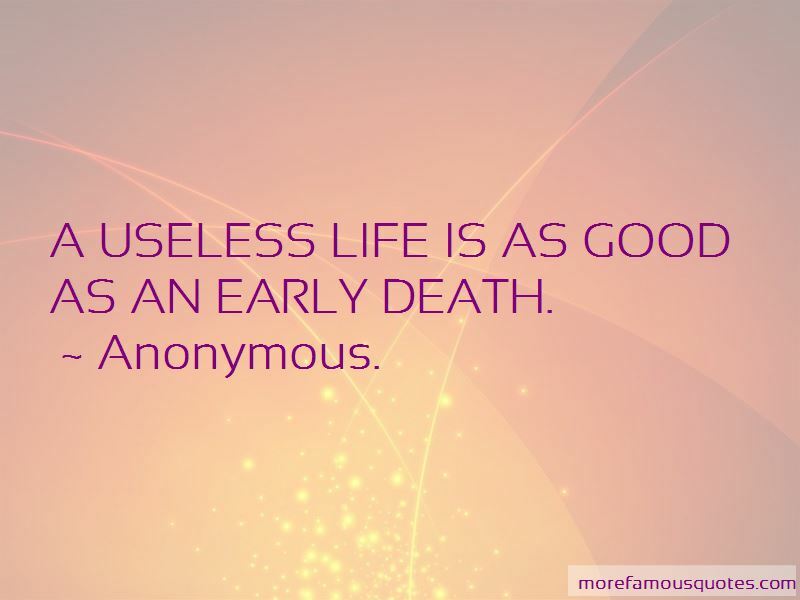 quotes: top 5738 famous quotes by Anonymous. Enjoy the top 5738 famous quotes, sayings and quotations by Anonymous..
free of the "I" and "mine,"
Baptism of Jesus 21Â When all the people were baptized,Â a Jesus also was baptized. As He was praying,Â b heaven opened, 22Â and the Holy Spirit descended on Him in a physical appearance like a dove. And a voice came from heaven: You are My belovedÂ Son. I take delight inÂ You! May those who sow in tears reap with shouts of joy. 6Â Â Â Â Â Â Â Â Those who go out weeping, bearing the seed for sowing, shall come home with shouts of joy, carrying their sheaves. PHi2.14 Do all things without murmurings and disputings:Â PHi2.15 That ye may be blameless and harmless, the sons of God, without rebuke, in the midst of a crooked and perverse nation, among whom ye shine as lights in the world;Â PHi2.16 Holding forth the word of life; that I may rejoice in the day of Christ, that I have not run in vain, neither laboured in vain. Soulmates are people who bring out the best in you. They are not perfect but are perfect for you. It's hard enough to track many simultaneous changes, let alone join in with them! However, we must embrace the fact that code changes: any code that stands still is a liability. No code is beyond modification. Treating a section of code as avoidably scary is counterproductive. They also developed a constructive doctrine, concerning degrees of probability: although we can never be justified in feeling certainty, some things are more likely to be true than others. Probability should be our guide in practice, since it is reasonable to act on the most probable of possible hypotheses. This view is one with which most modern philosophers would agree. Self-preservation is the fundamental motive of the passions, according to Spinoza; but self-preservation alters its character when we realize that what is real and positive in us is what unites us to the whole, and not what preserves the appearance of separateness. 1. Situation. Describe a situation that is, or was, emotionally significant to you (that is, that you deeply care about). Focus on one situation at a time. 2. Your Response. Describe what you did in response to that situation. Be specific and exact. 3. Analysis. Then analyze, in the light of what you have written, what precisely was going on in the situation. Dig beneath the surface. 4. Assessment. Assess the implications of your analysis. What did you learn about yourself? What would you do differently if you could re-live the situation? Do you think they'll keep us together?" Pyp wondered as they gorged themselves happily. Toad made a face. "I hope not. I'm sick of looking at those ears of yours." "Ho," said Pyp. "Listen to the crow call the raven black. You're certain to be a ranger, Toad. They'll want you as far from the castle as they can. 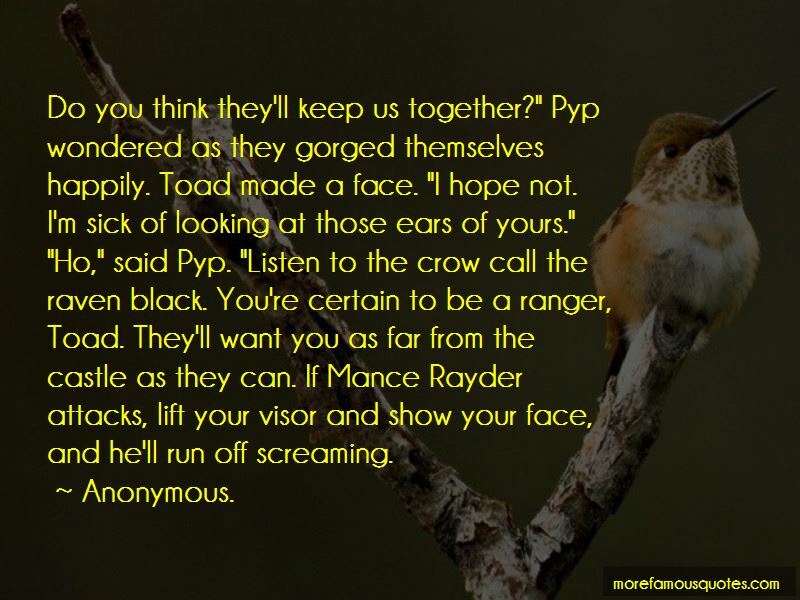 If Mance Rayder attacks, lift your visor and show your face, and he'll run off screaming. She was beginning to like this guy. She'd fallen in love with him the moment she first saw him, and she would love him now until the end of world. But she'd never dreamed she'd like him so much. “I think it's strange - so alike and yet so different! We are capable of working together, of building the Pyramids of Egypt, the Great Wall of China, the cathedrals of Europe and the temples of Peru. We can compose unforgettable music, work in hospitals, create new computer programs. "But at some moment all this loses its meaning, and we feel alone, as if we were part of another world, different from the one we have helped to build." "At times, when others need our help, we grow desperate because this prevents us from enjoying life. At other times, when nobody needs us, we feel useless. Want to see more pictures of Anonymous. quotes? Click on image of Anonymous. quotes to view full size.